BOB-LO ISLAND BOB-LO BOAT photo picture print art photograph for sale. BOB LO ISLAND and BOB LO BOAT aerial picture photo art print and Detroit Bob-Lo boat picture art photo print poster for sale. This historic Bob-Lo Island Amusement Park BobLo Boat photo picture print is a very rare aerial Bob-Lo Island photo showing Bob-Lo Island Amusement Park with the Bob-Lo Boat The S.S. Ste. Claire at the dock, letting off passengers for a day of fun at the now defunct much loved Bob-Lo Island Detroit Amusement Park. In this old Bob-Lo Island picture photo we can see the souvenir stand at the entrance to Bob-Lo Amusement Park and just past it the Ferris Wheel. 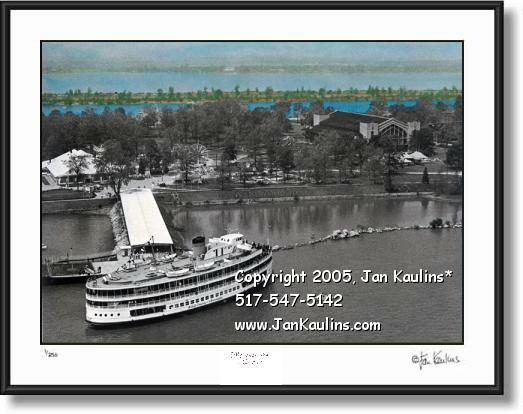 The very large structure to the right of this historic Bob-Lo Island Amusement Park art photo print is the grand Albert Kahn Dance Pavillion, named after and designed by one of Detroit's most noted architects. "This vintage historical Bob-Lo Island Bob-Lo Boat Ste. Claire photo was hand-colored and printed by Jan Kaulins."